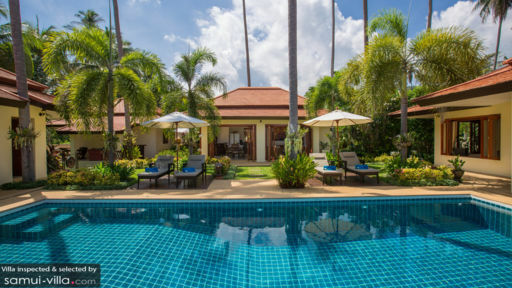 Baan Tawan Chai Villa is a seafront, vacation complex composed of about three pavilions – all exemplifying Thai coastal elegance. Interiors are appointed with complementary, finely finished and elaborate, as well as beautifully crafted woven wood furnishings and fixtures. Amenities, at once, are distinctively of hotel and resort grade – to enhance ease and fun of each and every guest. 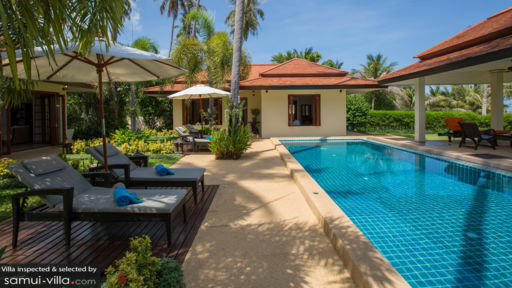 Built along Bang Kao Beach, Baan Tawan Chai Villa, truly, creates for you exotic and fine vacation living with a faraway, seaside appeal. The villa has four air-conditioned bedrooms in two other pavilions – two bedrooms in each pavilion. Three of these bedrooms have double beds, and one bedroom has a queen-sized bed. All bedrooms have dedicated, semi-open bathrooms with indoor and outdoor rain showers. One bedroom, however, also has an outdoor, fitted bathtub. All bedrooms have direct access to the swimming pool. At the center of the property’s exterior is the 10-meter swimming pool. After your morning swim in the beach, immerse yourself into the pool’s inviting, crystal clear, blue, fresh waters and continue your communion with your most favorite element. Then, move over to the adjoining jacuzzi and ease aching muscles in its bubbly, heated waters. For a tan, you can lounge on cushioned, woven wood pool beds partially covered by large umbrellas on the poolside wooden decks, or on beach chairs out on the shore. But when the temperature rises, withdraw to the shade of the poolside sala and sit back on the day bed or on the wooden chairs as you enjoy a cool, fruity drink. At the villa’s semi-open, airy and high-ceilinged main pavilion is the living area with its hefty, cushioned and elaborate, woven wood couch and chairs. Here, you can all gather for moments of family or friendly bonding. Adjoining is the dining area. On its dark, timber wood table for eight, you can all indulge on authentic local cuisine – as well as international favorites – dished out by the resident chef from the well-equipped, modern kitchen behind the dinner table. On duty to deliver the villa’s everyday services is an efficient staff composed of a personal guest assistant as well as housekeepers. In addition to the chef, a babysitter, a driver, a laundry helper and a spa therapist may be called in upon your request. However, their services come with a separate charge. Car rental is also available. 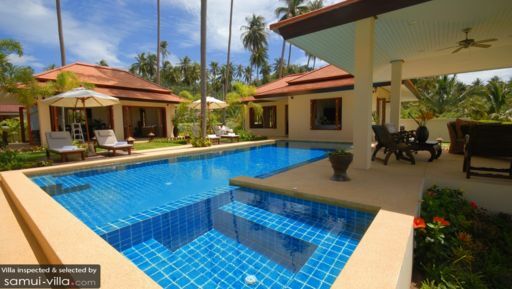 Baan Tawan Chai Villa is situated along Bang Kao Beach. Hop aboard a traditional boat for an expedition to nearby Koh Matsum and Koh Taen where you can also go swimming and get active with different water sports. On another day tour, go see Wat Kunaram and the remains of a mummified monk, the Laem Sor and Khao Chedi Pagodas, as well as Grandfather and Grandmother Stones. On a separate excursion, go nature tripping at the Samui Aquarium, the Tiger Zoo and the Butterfly Garden.